Maybe you want to lose a little weight. Namaste to that. While many professional trainers point people to specific diets or intense workouts, they may pass by yoga. That’s too bad: The practice that can play in integral role in shedding unwanted pounds. Even the routine that ends with everyone’s favorite relaxation pose, savasana, can have positive effects when it comes to a healthier lifestyle. Studies point to the many ways yoga can provide physical, behavioral, and emotional changes that can be turned into useful tools for weight loss. We dug into the research to find out how exactly sun salutations, inversions, and deep hip openers can be your secrets to a healthier relationship with the scale. First: There are many different types of yoga, and some are more intense than others. From gentle hatha to dynamic vinyasa, alignment-centric Iyengar to balanced yin, the type or types of yoga you practice influence how much your muscles are put to the test. To get your heart pumping, your best bet is likely a vinyasa flow class. This dynamic practice links movement and breath. In most classes the pace is quite fast, meaning you don’t hold each pose very long. For a little (okay a lot) of extra sweat, look for a heated vinyasa flow where rooms are set to around 90 degrees (some even go higher). Many say the heat helps open up the muscles, allowing you to get deeper into poses, and adds an extra mental and physical challenge. By being selective with yoga classes, you’ll find many of the same types of movements at other fitness classes. For example, many yoga poses require muscle strength, whether it’s using your hamstrings to sit in chair pose, or shoulders when holding warrior II. There’s science on our side, too: Many studies have looked into the effects yoga can have on physical strength. Routines including sun salutations have been shown to increase muscle strength and reduce body fat. What about other types of yoga? Can they promote weight loss? The short answer: yes, definitely. And that’s because there’s one thing that all types of yoga have in common, and that’s the practice of mindfulness. In yoga, a core component is to become more aware—of your breath, your body, and the present moment. What does this have to do with weight loss? Well, a good deal. The more aware we are of our body, the more mindful we can be when it comes to hunger and satiety. Researchers have tracked how mindful eating can help people maintain and lose weight. In the same way yoga helps us become aware of each breath, mindful eating develops a greater awareness of each bite of food we take. This means you may pay closer attention to the food you eat, making you less likely to eat an entire bag of chips in one sitting. Another interesting connection between yoga and food is the idea of self-compassion. Yoga can help us be kinder to ourselves. Research suggests that when we are less likely to beat ourselves up over a late-night diet slip-up, we’re more likely to get back on a healthy track. Now, that’s a long list. But we’ll zero in one of the other benefits mentioned: stress and anxiety reduction. Regular yoga practice can help us better handle stress and anxiety. And the more stressed we are, the more susceptible we are to weight gain, especially via binge eating or sleep deprivation. So there you have it! 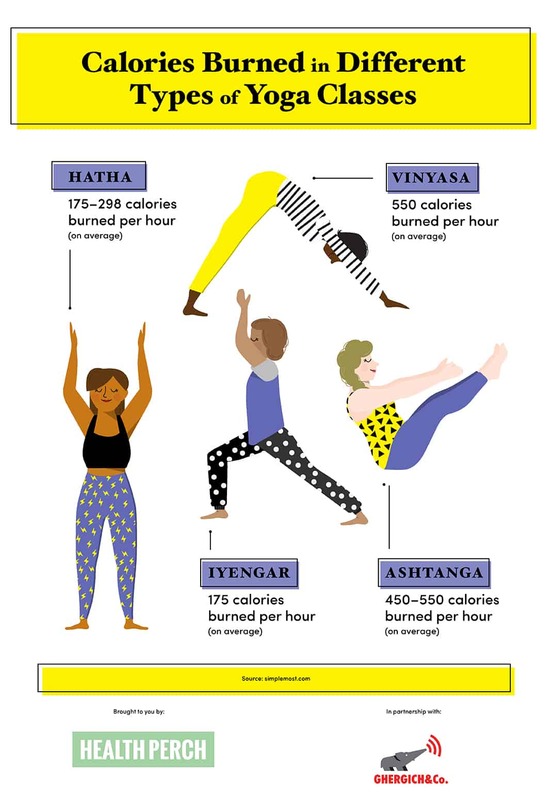 Contrary to popular belief (which you may hear in the weight room) there are plenty of reasons why yoga can contribute to weight loss. So roll out your mat, get into down dog, and see your health habits transform.